What happens when a two-headed cowboy, a high school dropout, and a poet abducted by aliens come together in 1970Ã¢ÂÂs Moab, Utah? The Scholar of Moab, a dark-comedy perambulating murder, affairs, and cowboy mysteries in the shadow of the hoary La Sal Mountains. Young Hyrum Thayne, an unrefined geological surveyor, steals a massive dictionary out of the Grand County library in a midnight raid, startling the good people of Moab into believing a nefarious band of Book of Mormon thugs, the Gadianton Robbers, has arisen again. To make matters worse, HyrumÃ¢ÂÂs illicit affair with Dora Tanner, a local poet thought to be mad, results in the delivery of a bouncing baby boy who vanishes the night of his birth. Righteous Moabites accuse Dora of the murder, but who really killed their child? Did a coyote dingo the baby? Was it an alien abduction as Dora claims? Was it Hyrum? Or could it have been the only witness to the crime, one of a pair of Oxford-educated conjoined twins who cowboy in the La Sals on sabbatical? Take a blazing ride with Hyrum LeRoy Thayne, the LordÃ¢ÂÂs Chosen Servant and Defender of Moab. His short rich life spans the borderlands of magical realism where geology, ecology philosophy, and consciousness collide, in Steven L. PeckÃ¢ÂÂs rip-snorting tale The Scholar of Moab. 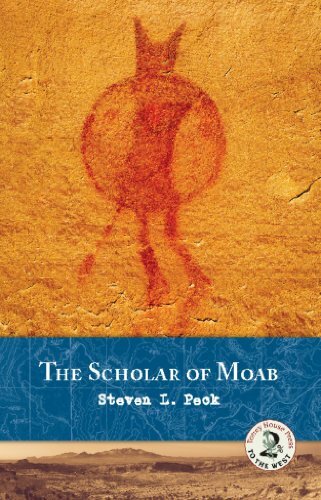 Steven L. Peck knows Moab, inside out. An evolutionary ecologist at Brigham Young University, Peck teaches the philosophy of biology. His scientific work has appeared in American Naturalist, Newsweek, Evolution, Trends in Ecology and Evolution, Biological Theory, Agriculture and Human Values, Biology & Philosophy. Steven also co-edited a volume on environmental stewardship. His creative works include a novel, The Gift of the King's Jeweler (2003 Covenant Communications). His poetry has appeared in Dialogue, Bellowing Ark, Irreantum, Red Rock Review and other magazines. Peck was nominated for the 2011 Science Fiction Poetry AssociationÃ¢ÂÂs Rhysling Award. Other awards include the Meyhew Short Story Contest, First Place at Warp and Weave, Honorable Mention in the 2011 Brookie and D.K. Brown Fiction Contest, and Second Place in the Eugene England Memorial Essay Contest. "Peck convincingly merges the genre of magical realism with American West fiction by invoking the power of personal testimonyÃÂnot his own, but by presenting the recorded testimony of his characters in letters, journals, poetry, and interview transcripts. Using these disparate voices, Peck concocts a strange and tragicomic brew of naivety, philosophy, faith, discovery, and loss." About: 2011 Best Novel, Association for Mormon letters2011 Finalist, Montaigne Medal, Eric Hoffer AwardsWhat happens when a two-headed cowboy, a high school dropout, and a poet abducted by aliens come together in 1970âs Moab, Utah?